This may be the deepest into the season I have stated my annual Detroit Tigers diary. With the possible exception of Jeimer Candelario, the team just hasn’t been terribly exciting or interesting to this point, “this point” currently being defined as sitting in the middle of a very mediocre AL Central with a 15-20 record. I didn’t not want to do this series this year; after all, if you write about the good times, I think you have to be disciplined enough to write about the bad times. It’s just that there didn’t seem to be a good excuse to get started. In retrospect, it’s obvious I was waiting on the call-up of Pete Kozma to get things rolling. Kozma signed on with the Tigers in January as a free agent, and he began the season in Toledo. After a rash of injuries, the team brought him up to the majors this week, and he’s making his Tigers debut right now, in a game against the Texas Rangers. The St. Louis Cardinals originally drafted Kozma out of high school with the eighteenth overall pick in the 2007 draft, and he broke into the majors with them in 2011. Outside of 2014 (448 PA in 143 games), the utility infielder didn’t play too much for the Cardinals, who granted him free agency after the 2015 season. The Yankees promptly signed him, but he spent all of 2016 riding the AAA rail for Scranton/Wilkes-Barre. After playing in just eleven games (ten PA) in the majors for the Yankees in 2017, New York designated him for assignment, and the Rangers claimed him off waivers. Kozma appeared in twenty-eight games for Texas before they too DFA’d him. He cleared waivers and finished the season in AAA Round Rock before becoming a free agent again. On May 21, 2017, Kozma hit his only home run as a Ranger. The shot came off of Detroit’s Matt Boyd in a 5-2 Texas win at Comerica Park. That would be the last major-league home run for Kozma until today, almost exactly one year later, when he hit one in his first game as a Tiger, coming in a game against the Rangers in Arlington. As of this writing, the Tigers lead the Rangers 4-3 in the top of the seventh inning. Kozma has reached base in all three of his plate appearances so far. As a concluding note, the title of this season’s Tigers diary is WTF, which is an acronym for a number of phrases that might describe this particular team. Officially, it stands for When the Tigers broke Free, the title of the song performed in the video above and the notion that the 2018 Tigers have broken from their past trajectory and now are writing the beginning of a new chapter. Nearly three years ago, Detroit Tigers fans said goodbye to Prince Fielder, whom the team traded in the 2013 offseason to Texas in exchange for Ian Kinsler. At the time, many were glad to see him leave, though some, including this author, were not. All must agree, however, that when Fielder left Detroit, he became barely a shadow of his former Ironman self. In his two years as a Tiger, he didn’t miss a single game. Excluding his rookie year, in the eight years he spent in Milwaukee and Detroit, he missed a total of thirteen games, playing the full 162 in four of those eight seasons. That’s an impressive accomplishment for any player. If one wanted to be cold about it, one might note that, 2014, Fielder’s first in Texas, was a year of insult and injury for Prince. Not only did his trade replacement, Kinsler, make the All-Star team on his way to completing the second-best season of his career, but Fielder underwent season-ending neck surgery in late May, appearing in just forty-two games for his new club. He seemed to bounce back in 2015, posting a .305/.378/.463 line in 158 games, but it has been trouble again for Fielder in 2016. Despite his team’s success, Prince arguably was the worst position player of the first half of the season, and things weren’t looking up in the second half. After playing in all but five of the Rangers’ games through July 18, Fielder again went on the disabled list and, after undergoing a second neck surgery, is expected to miss the remainder of this season. Sources: Prince Fielder’s career appears over. #Rangers expected to hold press conference tomorrow. To be clear: Prince Fielder is not retiring. He is medically disabled and doctors will not clear him to play, sources say. If true, then, as a number of people have pointed out, Prince will finish with a .283/.382/.506 line, .304 TAv, .377 wOBA, 133 wRC+, 26.8 fWAR / 23.8 bWAR / 30.3 WARP, and 319 home runs, the same number of home runs his father, Cecil, with whom he seems to have reconciled, hit in a career just one season longer than his son’s. My first post over at Banished to the Pen, a new baseball blog, takes a very serious look at a rumor of debatable seriousness: that the Texas Rangers considered adding Max Scherzer as a backup catcher before he signed as a starting pitcher for the Washington Nationals. Overnight, the long-anticipated news of this baseball offseason finally broke: The Washington Nationals won the Max Scherzer sweepstakes by signing the former Detroit Tiger to a seven-year, $210 million contract. Scherzer made news last March when, heading into his final season before becoming a free agent, he turned down the Tigers’ six-year, $144 million offer to stay with the team. That failed (from the team’s perspective) dance fouled up a variety of personnel matters for Detroit. They had already traded Prince Fielder and much, but not all, of his contract to Texas and starter Doug Fister to Washington for figuratively literally nothing all probably in an attempt to clear the books for Scherzer’s new contract. When Scherzer balked at the offer, the team responded by giving Miguel Cabrera all the money. Last season got off to a rough start, and, at least from a business perspective, Scherzer was at the center of it. Flying Tigers: Detroit finds relief, but at what price? Last night, the Tigers traded two of their top pitching prospects, Corey Knebel and Jake Thompson, to the Texas Rangers in exchange for reliever Joakim Soria. My immediate reaction was that Knebel and Thompson were a steep price to pay for Soria (or virtually any single relief pitcher), but two realities likely drove up the price: 1) in general, it’s a sellers’ market, because league-wide parity (some might say mediocrity) at this point in the season means there are more buyers than sellers as we approach the main trade deadline, and 2) everyone knows the Tigers need bullpen help and therefore have Detroit GM Dave Dombrowski a little bit over a barrel when it comes to negotiation leverage. However you weigh the trade pieces here, Detroit had to make a move like this if it wanted to contend this October, and the equities certainly are not as imbalanced as they were in some of the Tigers’ preseason moves. 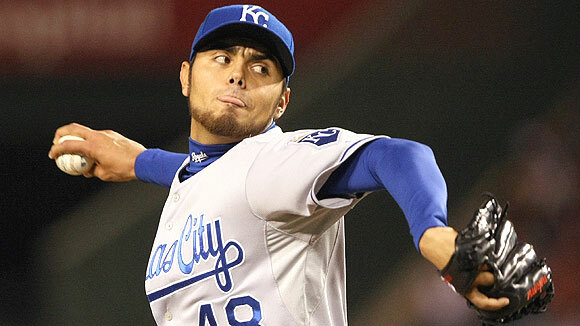 Soria is a thirty-year-old relief pitcher who was born in Mexico and spent the first five years (2007-2011) of his career in Kansas City. After sitting out all of 2012 while undergoing Tommy John surgery, he joined on with the Texas Rangers in 2013. While a glance at his numbers suggests that he picked up in 2013 where he left off in 2011 (in a hitter-friendly park in Arlington), he has been absolutely excellent so far in 2014.